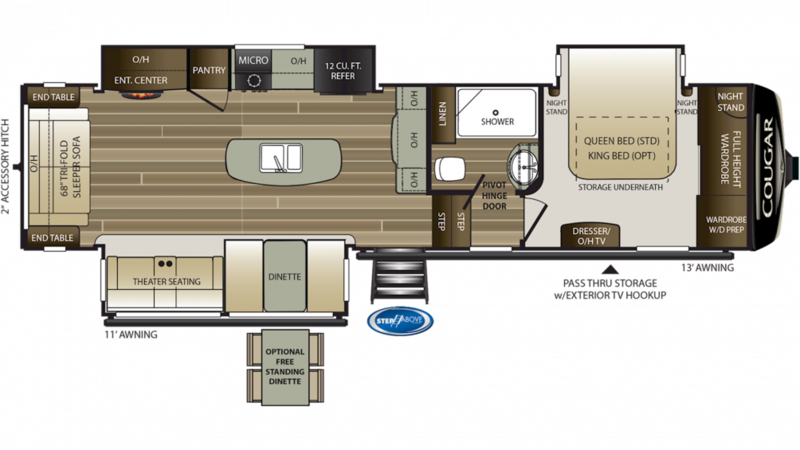 If you have your eye on the 2019 Keystone Cougar 315RLS then come and see us at Lakeshore RV Center in Muskegon, Michigan for a price you won't believe! We'll save you thousands on this 5th Wheel because we're #1 in RV sales and service, and we sell every brand we carry at wholesale prices in Michigan and beyond! We're conveniently located at 4500 E Apple Ave Muskegon Michigan 49442! And with our fast, reliable delivery worldwide, you can call us at 231-788-2040 and have this great 5th Wheel at your door in no time! Stretch out with ease in this 35' 8" long, 8' 0" wide, and 12' 6" high 5th Wheel! The 3 slides offer extra legroom. The 30000 BTU furnace and 15000 BTU a/c keeps the Keystone Cougar nice and temperature controlled! On cold, rainy day or night, you can fire up the fireplace for some much-needed warmth and beauty inside this RV!